IS IT AN ECONOMIC MIRACLE? President Mkapa and his Chama cha Mapinduzi (CCM) party achieved an overwhelming victory in the October 29 elections in Tanzania. He won primarily because he had maintained peace but there were other reasons. He had established a good macro-economic climate for investment and had begun to tackle corruption. People had been impressed by the way in which 40 incumbent CCM MP’s had been rejected at the time of selection of CCM candidates for seats in parliament for what was described as ‘violation of party ethics and regulations’ (see Tanzanian Affairs No 67). The Tanzanian electorate has benefited also from some 40 years of education in politics from the late Mwalimu Nyerere and has become astute in choosing its representatives. People registered to vote in much greater numbers this time (8.1 million cf 6.8 million in 1995), they turned out in their thousands to listen to the four presidential candidates (causing all of them to believe that they were going to win!) and then proceeded to vote in large numbers. They largely rejected parties considered to be religiously biased -the Civic United Front (CUF) on the mainland was alleged to be Muslim oriented -and tribally-based parties, as the United Democratic Party (UDP) in the Lake Victoria regions was alleged to be. They had no doubt about which candidate they considered to be of presidential calibre and voted for CCM because they feared that the other parties spelt disunity in the country. The President also had the advantage of a CCM party united and well organised in every village and with substantial funds for the campaign. The fact that government subsidies for political parties had been stopped handicapped the previously relatively well-financed main opposition parties. Observers praised the mainland election for being broadly free and fair. Even if there had been irregularities, they could not have affected the overall result. The subsequent action of three opposition parties (not CHADEMA) in saying that the election had not been free and that they would not recognise President Mkapa seemed surprising. By December 10 however, when the country celebrated 39 years of independence, another party leader (John Cheyo of the UDP) was advising colleagues to bury their differences and cooperate with the government in the interests of development. For the disunited opposition the election was a disaster from which it has much to learn. CUF’s Ibrahim Lipumba obtained only 16.3% in the presidential election and just two mainland MP’s in the National Assembly (none last time). Former idol of the masses and vigorous anti-corruption fighter Augustine Mrema was humiliated. His vote dropped from 27.8% in 1995 to 7.8% in 2000 and the successful candidates in the party which he had recently joined totalled only four compared with the 16 he had led to victory in 1995. The NCCR­Mageuzi party which he led at the time had self-destructed before the election through personality differences and obtained only one seat. United Democratic Party (UDP) leader John Cheyo could hardly believe that, after five years of effort and an impressive record in parliament, he got only 4.2% of the vote (6.4% last time) and the same number of MP’s -three. The CHADEMA party, which was in alliance with CUF in support of Lipumba for president, got 4 MP’s compared with 3 in 1995. At the Kenya/Tanzania border post Tanzanian customs officers demand that all the rucksacks on the roof -the luggage was nearly all rucksacks -had to be taken down and then had to be taken by each tourist to the customs office about 20 yards away. Each piece was then awarded a cross in chalk. “Its just like my country -we have petty bureaucrats there too” said a young Indian tourist on his way to climb Mount Kilimanjaro. As we continue the journey we soon see evidence that there is an election going on. There are green CCM flags outside many shops in the villages we pass through and most houses sport a coloured poster of President Mkapa. At Usa River between Arusha and Moshi a large crowd has gathered in a field. Ten minutes later a police car waves to our driver to tell him to get off the road. It soon becomes apparent that the procession of cars coming towards includes one containing the President of the Republic. The tourists rush for their cameras -but it is too late. Some 20 vehicles pass us at high speed. We read about President Mkapa’s speech there the next day. My hotel in Moshi is doubling as the regional HQ for the CHADEMA PARTY one of the 13 parties taking part in the election, of which four have candidates for the presidency: the ruling Chama cha Mapinduzi -CCM; Tanzania Labour Party ­TLP; the Civic United Front CUF/CHADEMA alliance and the United Democratic Party (UDP). The other main party -the NCCR-Mageuzi wanted to do the same but its candidates failed to register correctly. The hotel’s car park is full of CHADEMA’s heavily-postered vehicles. On arrival I hear that there is no time even to shake off the dust from the journey. The legendary former Deputy Prime Minister and later leader of the biggest opposition party -The NCCR-Mageuzi -is in town and about to speak. It’s a fairly large crowd. Not as large as I had anticipated. Five years ago, any appearance by Augustine Mrema was like the arrival of the Messiah. First we hear an eloquent warm-up speech by Archbishop Kakobe of the Full Gospel Fellowship Church whom many in the crowd say that they have specifically come to hear. His well argued address is punctuated with good humour -an essential component of political speech making in Tanzania. He does the candidate no harm at all. Then Mrema takes the stage. The same as always. “They say I will destroy the peace in this country ….. Tanzania will become like Burundi and the Congo” he begins before launching into his favourite themes -corruption, dishonesty, poverty, the price of food, of coffee ….. He is in good humour and soon has the crowd on his side. He has not lost his popular touch but the magic has gone. (Mrema’s TLP won only two seats in his own Kilimanjaro Region). In the midst of the good­natured crowd, one young man leans on his bicycle, to which he has tied a prominent coloured poster featuring the rival CUF/CHADEMA alliance presidential candidate -Ibrahim Lipumba. I decide that this will make a good photograph (later I lost my camera!). The man agrees to the photograph with a smile and those around him also see the funny side and smile too. What an excellent example of tolerance and democracy. CHADEMA stalwart offers to drive me around. I point out that in the interests of fairness I also want to see what the other parties are up to. We agree to go first to a NCCR meeting. My companions remove their CHADEMA badges. Moshi Urban’s present MP is from the NCCR but at this meeting the assembled throng comprises just six adults and seven children. It is apparent that he will not be re-elected (He got just 1,406 out of 44,863 votes). I feel sorry for the lonely speaker but my CHADEMA companion is delighted. Then to a small CCM meeting -lots of lively music but seemingly not much enthusiasm for the message. The candidate is President Mkapa’s sister-in-law. Somebody asks me: “Don’t you have a word for it in English?”. “Do you mean nepotism?” I reply. “Yes that’s it” he says. The CHADEMA meeting, which according to my companion was to be the climax of my tour, had had to be cancelled because of a death in the neighbourhood where the meeting was to be held. So, as an alternative, I am taken to Mahoma village in Old Moshi, in the foothills of Mount Kilimanajro (Moshi Rural constituency) to another CHADEMA meeting. A very enthusiastic crowd. I am introduced publicly to the candidate and then, to my great embarrassment, a microphone is thrust into my hands and I have to say a few words. At the end, the applause is so fervent that I rather wish that I was the candidate myself!. (CHADEMA didn’t win this one -TLP took the seat). In the evening I find the Moshi Urban CHADEMA candidate, who is clearly running a highly efficient campaign, listening to recordings his ‘spies’ have obtained at the meetings of his rivals that day. He explains how he carefully notes down what they have said and then prepares the rebuttals he will deliver in his own speeches tomorrow. (Mr Philimon Ndesamburo (CHADEMA) won 25,183 votes compared with 15, 922 for his CCM opponent). Dar es Salaam. By now I have spoken to scores of people and when I ask them how they’re going to vote on Sunday, everyone has answered the question without hesitation and told me exactly why they have decided to vote they way they will. There is no hiding behind the kind of reply you would get in the UK: “It’s a secret ballot you know”. What an impressive open society the new Tanzania has become. I try to find out where CUF is holding its rally this afternoon. I ask taxi drivers, hotel staff, passers by, even a distinguished looking man who is concealing a CUF badge in his pocket. Nobody knows where the meeting will be held, where the CUF headquarters is or even where I might find CUF’s telephone number. It would be just the same in the UK of course but Tanzanians seem to be much more enthusiastic about their politics -DRB. CCM 203 elected (before the elections CCM had 186 elected seats; total 222) plus 40 special seats for women plus 10 additional seats under a recent constitutional change). Total 253 . (Subject to correction). CUF 2 elected on the mainland plus 16 from the Zanzibar island of Pemba, compared with 24 from Zanzibar in 1995 (including three from Unguja) plus four special seats for women. All except the two elected from the mainland decided to boycott the Union parliament (and are threatened with expulsion if they continue to do so until April 2001). Prominent leaders who lost their seats included NCCR-Mageuzi Chairman James Mbatia, NCCR Founder Mabere Marando (Rorya, Mara), CHADEMA chairman Bob Makani, and the former Dar es Salaam Mayor Kitwana Kondo (CCM). Among the 10 male MP’s nominated by the President were Chief Fundikira and Mr Kingunge Ngombale-Mwiru. COAST (8) with CUF second in every seat, IRINGA (11), DODOMA (8) with CCM Vice-Chairman John Malecela taking 33,118 out of 35,372 votes (CUF very nearly took Kondoa North), LINDI (8), MBEYA (12), MOROGORO (10), MTWARA (7), MWANZA (13) with UDP usually in second place, RUKWA (12) with the election in Kwela postponed, RUVUMA (6), SINGIDA (7) with massive CCM majorities, TABORA (9) with CUF scoring high votes in most constituencies and TANGA (11) with CUF second in every seat. DAR ES SALAAM CCM 6. CUF 1. A big surprise was the failure of CUF to win the hotly contested Temeke seat, held at one time by Augustine Mrema, but eight opposition parties split the vote. got 89,665 votes compared with the victorious CCM’s 60,872. KAGERA CCM 10. CUF 1 (Bukoba Urban) TLP 1(Kyerwa with a majority of 148 out of 45,102 votes cast). KIGOMA CCM 5. NCCR 1 (Kigoma South) CHADEMA 1. The repeatedly contested Kigoma Urban seat was won this time by Dr Amin Kabourou (CHADEMA) by 21,615 votes to Azim Premji’s 20,82:L. He became leader of the opposition. time CCM got 5 seats (including Siha, Mwanga and Rombo). CHADEMA got 2 (Hai and Moshi Urban) and TLP 2 (Moshi Rural and Vunjo). MARA CCM 6. TLP 1 (Mwibara -majority 313 out of 25,613 votes cast). The party missed taking Tarime by 29 votes. MWANZA CCM 13 with UDP usually in second place. SHINYANGA CCM 7 UDP 3. Solwa result not known. International observers had much praise for the way in which the elections were conducted. However, the broad-based Tanzania Election Monitoring Committee (TEMCO) described in the Guardian as perhaps the most experienced and painstaking election monitoring body in the country, issued a warning in October that the elections were ‘heading to become unfair’ because of the restrictions often placed on opposition candidates which did not apply to those from CCM; for example police actions in stopping opposition meetings on time at 6pm while allowing CCM meetings to proceed to their conclusion. (TEMCO’s full report on the elections was not available when we went to press -Editor). According to the Media Council of Tanzania, Dar es Salaam TV stations gave more time during the election campaign to CCM than to other parties. President Mkapa has retained his key lieutenants: Vice ­President Dr Omar Ali Juma, Prime Minister Frederick Sumaye, and Attorney General Andrew Chenge. The National Assembly elected Speaker Pius Msekwa again. For his 46-member new government the President appointed 19 new faces, dropped 13 old ones including Messrs Makweta, Kimiti, Mbonde, Chidua, Ali Ameir and Kusila and created a new Ministry of Cooperatives and Marketing. The cabinet comprises five professors, six doctors and four soldiers and includes four women. The new ministry and the Ministry of Regional Administration and Local Government will move to Dodoma next year. In Zanzibar Aman Abeid Karume (CCM) was declared to be the new President and CCM won a two thirds majority in the House of Assembly but the election was seriously flawed and had to be held again in 16 constituencies in the Urban West region on November 5. The results have been rejected by all the ten opposition parties which took part. The leading opposition party, CUF, refused to recognise the government and its MP’s decided to boycott the National Assembly and the Zanzibar House of Assembly in protest. 1O.00am. Final election rallies: The CCM rally is a sea of yellow. More than 50% of the big crowd are dressed in CCM yellow caps, green and yellow t-shirts with portraits of the presidential candidate. Picnic atmosphere. People are enjoying themselves -chatting, shopping at scores of small stalls, singing, dancing, playing drums. Less than 25% are listening to the speeches. No police in sight. The CUF rally is quite different. A quiet, disciplined and serious crowd listening to the speakers -CUF Zanzibar leader Seif Shariff Hamad speaks then Lipumba at his penultimate rally -he is flying to Dar es Salaam this afternoon. Armed police are stationed every 10 yards around two sides of the meeting and chivvying people on the periphery who are standing or sitting where the police feel they should not be. 1O.15am Mlandege Polling Station (Darajani Primary School). Voting is proceeding in an orderly way. I am told that some people from the mainland had come and tried to vote but they had been chased away. 11.20am Jangombe Polling Station. Very long queues. Voting has not yet started because there are no ballot papers and forms. I ask the Returning Officer if I may speak to the party agents. “You can ask me questions. You can’t do anything else”. After one or two I say that I have no more questions. He says “Then get out”. This seems reasonable under the circumstances. 11.45am. Kwahani Primary School. Just after we arrive we hear loud applause from hundreds of waiting voters. Voting has not started but a truck has just arrived with the missing documents Then the delivery man reveals that he hasn’t brought ballot boxes for the two presidential elections nor the ink to mark voter’s fingers. Angry reaction. Voting can’t start. CCM monitor points out that voting must close at 5.00pm. Loud dissent from almost everyone. But people soon become calm again and accept what has happened (During the whole day the calm and patience of the voters was remarkable to witness). 12.15pm. Mikunguni. Voting has just started. Ballot boxes are being sealed, in the presence of party monitors with the help of lighted candles. By chance the Chairman of the Zanzibar Electoral Commission, Mr. Abdulrahman Jumbe Mwinyi is present. I ask him about the delays. “Inefficiency” he replies. One or two members of his staff had got things wrong. “And that is the only reason for the delay” he adds before he moves on. 1.00pm. Amani Stadium. Voting had started early and everything is in good order. 1.45pm. Jimbo la Kikwajuni. (Kisiwa Primary School). Voting proceeding slowly. Many have been waiting seven hours. 4.45pm. I pay a visit to the ZEC headquarters to find out how the election is going generally. As I arrive CCM presidential candidate Karume with a retinue of top CCM people is leaving. 7:30pm. Bububu polling station, about 8 kms from town. Pitch dark. Voting has not yet started. Scores of unhappy people surround me assuming that I am a foreign observer and I will do something. Heavily shielded and armed police everywhere but I am not impeded after showing my press card. 8.00pm -a puncture! A Monitor from the TADEA party helps us with his powerful torch to change the wheel. 8.30 pm Jangombe polling station. Pitch dark. A large number of people. I speak at length to a young civil servant here to do his duty and supervise one classroom where voting should have taken place. He is eager to hear what is happening elsewhere. He has received no instructions all day and people have been blaming him for not letting them vote. He has told them that he also is hungry, thirsty and tired. The people accept what he says. In spite of the darkness I feel remarkably safe. Hundreds of people around the polling station are still hoping to vote. 9:30pm. Meet an American observer who said he has seen plenty of examples of bad administration but no actual rigging. He had witnessed the opening of some ballot boxes in Stonetown (a CUF stronghold) and had noted that there were about 200 votes for CUF and 50 for CCM. Then the counting had been stopped. 9.45pm. Another journalist tells me that the German Swahili radio service ‘Deutsche Welle’ had managed to interview one of the voters said not to be from Zanzibar. This voter was said to have explained that they had been brought over from Dar es Salaam the night before. 10.00pm We notice two long lines of teenage boys near another polling station in Stonetown. I ask them what they’re waiting for. They refuse to speak. I ask the policeman who is with them and he explains that they are security guards for the Zantel office. They look very young and very numerous for such a job. My companion wants to ask more questions because he thinks that they are villagers brought in from the countryside to vote. I notice armed marine police rapidly descending upon us and not looking friendly. We leave very hurriedly. Monday. October 30. The day after. 8.00am. Go to the port to buy a ticket for my planned return to Dar es Salaam in the afternoon. Hear that the election has been annulled by ZEC in 16 constituencies (in Zanzibar town and the West coast). Three of these seats were won by CUF in 1995. 10.00am Attend a packed CUF press conference at Bwawani Hotel. CUF leader Hamad says that the election has been a complete mess and should be run again in its entirety. It would take three to six months to organise. The Field Force had taken ballot boxes away and nobody knew where they were. ZEC was responsible for the chaos. Zanzibar needed a provisional government consisting of respected people to conduct new elections. “If ZEC ignores us, as usual, they will bear responsibility for what then happens. It will prove that the ZEC is working with the CCM . Yesterday ZEC had claimed that they had nullified the results in two whole districts because of irregularities. In fact CCM had told ZEC to close the counting because CCM was losing. There had been irregularities everywhere. In Kanyageni the Field Force had confiscated all ballot boxes by force. At Mjimkongwe they had brought people from all over to vote. At Bububu they tried to bring ballot boxes from elsewhere. “Did you meet ZEC and complain?” he was asked. “My manager went five times but could get no meaningful answers”. If the Commonwealth Agreement (on reform of the ZEC) had been implemented we would not be in this position he concluded. 11.15 am. On advice from the local BBC correspondent all the journalists move off to the Serena Hotel to receive a press release from the Commonwealth observers. 11.30am I suggest that we go to the CCM HQ to hear what they have to say but we do not reach their office. On the main street we see people scattering in every direction. Police beating people up. The police suddenly jump out of their truck and start shooting. (They were shooting in the air although that wasn’t apparent at the time). I am heard telling the driver to turn round fast and saying that I don’t want to die in Zanzibar. Shops close. People disappear. Have to cancel a lunch engagement. 6.30pm Arrive in Dar es Salaam. Am trying to separate gossip and rumour from the truth but one persistent rumour is that perhaps the President of Zanzibar, Dr Salmin Amour (who was not allowed to run for a third term and his favoured candidate to succeed him was not selected) might have been the cause of the problems in Zanzibar. It is announced that all parties except CCM have decided to boycott the second election in the 16 constituencies in Zanzibar. CCM supporters insist that the violence was not all on one side. “CUF started throwing stones before the police started firing” one pointed out. A new CCM Councillor tells me that, after attending a rally in Dar es Salaam, his car windscreen had been broken. But CUF had paid for the damage! Evening. A documentary lasting two hours on TV features the respected editor Jenerali Ulimwengu, Dar es Salaam University Professor Samuel Mushi and Dr Lauran N dumbaru from Zanzibar talking about the Zanzibar elections. The programme has as its background remarkable scenes of the beating up of people prior to the shooting in the air (which I had witnessed). The video showed that, as CUF’s Seif Hamad had left his press conference, his supporters had started celebrating on the main street Darajani. “We’ve won. We’ve won” they were shouting. Smiles all round. Like a fiesta. The police had responded angrily and started beating people. Some people had reacted by throwing stones. Police anger had increased. Some, including an old lady, who had fled into a nearby shop, were dragged out and beaten again. Nobody resisted. Most could be seen to have their hands in the air in surrender. One policeman had vented his anger by stamping heavily on a bicycle. Extracts from the discussion: “This is a shock…. Shameful … Where are we going? Not understandable. Violence even when people are lying down! The police did nothing to stop cameramen taking the pictures! CUP have been complaining for long about human rights abuses; this justifies their claims …. Who will look after the ballot boxes for the next week? .. Zanzibar is being destroyed” -DRB. Dr Gaositwe Chiepe, former Botswana Foreign Minister and Chairperson of the Commonwealth Monitoring Group. “We wish to record our sadness and deep disappointment at the way in which so many voters were treated by the ZEC … in many places this election was a shambles. The cause is either massive incompetence or a deliberate attempt to wreck at least part of this election. Either way the outcome represents a colossal contempt for ordinary Zanzibar people and their aspirations for democracy … in some places the voting went well and staff were often efficient and dedicated. But the scale of the organisational failure is such as to totally cancel out these positive factors …. the Zanzibar elections should be held again in their entirety. But first the existing election management machinery must be reformed from top to bottom … “. What had happened in Zanzibar was a travesty of democracy. The failure of the ZEC had erased all the good things the international community had seen. Just before departure she added: ‘We were confirmed in our view that elections should be held again by the way in which the suspension of elections in the 16 constituencies was implemented. It suggests that there may be even greater cause for concern”. SADC mission chairman Geoff Doidge said that the ZEC’s capacity to organise the elections fell far short of expectations. Given the comparatively small size of Zanzibar it was difficult to believe such problems were purely technical … all parties should urgently meet to agree on fresh elections under a reconstituted ZEC. There had also been unequal access by opposition parties to the media and other resources. Laurie Cooper, International Foundation for Election Systems, Washington DC: “The Zanzibar elections squandered the opportunity to advance Zanzibar’s transition to democracy. The ZEC’s suspension of the election operations compromised the integrity of the election process archipelago wide ….. the removal of ballot boxes from the voting stations … in Jangombe, Amani, Sogea, Wawi and other stations without the full participation of poll workers, party agents, candidates appeared to have been hastily implemented and ill-conceived. The 14­member delegation is of the opinion that these elections did not merit the trust of Zanzibar’s citizens … new elections in all constituencies properly conducted could address the volatile situation …. the delegation notes with deep regret the actions of the security forces …. ” . CCM took 28 seats in Unguja and 6 in Pemba (compared with none last time) = 34 elected MP’s plus six special seats for women, plus five regional commissioners plus the Attorney General -Total 46 seats. CUF got 17 elected seats compared with 24 in 1995. (These figures may not be exactly right but will be corrected in the next issue of TA if necessary -Editor). The CUF boycott was fully supported as illustrated by some of the results of the election for National Assembly MP’s this year compared with those of 1995. In Kikwajuni CCM scored 2,448 votes in 1995 and 6,101 in this election. CUF’s vote fell dramatically from 1,985 in 1995 to 212 in 2000. In Jangombe CCM had 9,947 votes in 1995 and 7,321 this year. CUF fell from 4,461 in 1995 to 293 this year. President Karume (52) is widely regarded as a conciliator and he lost no time in taking several steps to ease the tension in the Isles. First of all he had a ‘clean sweep’ in selecting his new 12­member cabinet (reduced from 14 for reasons of economy). He appointed as Chief Minister Mr Shansi Vuai Nahoda (38) former TV producer and information officer. The cabinet includes one woman but does not include a single one of the ministers who served under previous President Amour. It also includes three ministers from Pemba (previously none). Of the four new Deputy ministers none were in Amour’s cabinet. The President made a further important move towards reconciliation by freeing the 18 CUF leaders who have languished in jail for three years charged with treason and another in releasing the 150 people who were arrested during the election. It was decided not to continue with the treason trial as treason could not be committed in Zanzibar because it was not a sovereign state. Many wondered why it had taken three years to find this out. On December 1 an apparently more friendly attitude to the press was reported in the Guardian. The government had apologised to various journalists who had been barred from the swearing in of President Karume. It had been due to ‘lack of proper communication between the authority and security guards’ it said. In his first speech to the new Parliament in Dodoma President Mkapa said that in the next two months the Union and Zanzibar governments would start resolving some of the issues undermining the smooth operations of the Union. He welcomed views from within and outside the country. All people should respect the peoples’ verdict, stop bickering and get down to work. The famous astrologer Shekh Yahaya Hussein was reported in the Guardian to have forecast a government of national union in Zanzibar within 14 months. WHAT WILL THE DONORS DO? Most Western donors stopped providing aid to Zanzibar during the last five years because of concerns about the 1995 elections and subsequent allegations of infringement of human rights in the isles. After this second irregularity-filled election what could they do? Cutting aid to Zanzibar did not seem to have been successful. Those who suffered most were the poorest sections of the population. With their constant stress on good governance and democracy however, would the donors not be accused of bias if, while enforcing sanctions against other countries, they left Tanzania alone? However, why should the 30 million mainlanders (compared with only 800,000 Zanzibaris) be punished when the conduct of the mainland election received widespread praise from international observers? For the Commonwealth, which had strived for two years to bring about an agreement between the warring sides and had finally obtained the signatures of CCM and CUF leaders to an accord in 1999 (under which the ZEC would be reformed), what happened must have been a great disappointment. Zanzibar’s CCM refused earlier this year to implement the reform of the ZEC in spite of repeated pleas from Commonwealth representatives. The new American administration also faces a dilemma. CCM represents continuity and stability. A CUF government in Zanzibar would be likely to be less enthusiastic about preservation of the Tanzanian Union and would probably cultivate closer relations with Arab countries some of which face serious conflicts with Muslim fundamentalism. Prime Minister Tony Blair congratulated President Mkapa on his election but said he had been disappointed with the events in Zanzibar. WHAT WILL THE OPPOSITION DO? CUF now faces a major dilemma. Well before the election its leader, Seif Shariff Hamad, recalling the probability that CCM rigged the 1995 election in its favour, stated that, if CCM ‘fixed’ the election again (his words) the result would be ‘a tooth for a tooth’. Immediately following the election CUF warned that if there were no new elections within four months under a reformed ZEC Zanzibar would enjoy no peace. During the following few days five small home-made bombs were detonated. One damaged the government-run Wete (Pemba) Hotel, another went off near a polling station and another seriously injured a member of the Electoral Commission. CUF denied responsibility. Tanzania has substantially increased its police force and army in Zanzibar and should be able to control the situation. If tensions were to continue however, the Union between the mainland and Zanzibar could itself be in danger. Many mainlanders are already weary of and embarrassed by the seemingly endless feud between those Black Africans in Zanzibar who were in favour of the 1964 revolution who tend to support CCM and those, many of whom have Arab roots, who were not in favour and now support CUF. If the animosity were to be turned into more violence the people of the mainland might want to reconsider their participation in the Union. One analyst suggested that Zanzibar needs a South African style ‘Truth and Reconciliation Commission’. Others consider that the best solution would be to ask the UN to conduct a truly free and fair election in the Isles. President Benjamin Mkapa, fresh from his huge election victory, has made it clear that he resents foreign interference in Tanzanian internal affairs. He took a strongly anti-CUF position before the elections in Zanzibar and after the elections even praised the police. He did however agree to launch an enquiry into what happened. According to CCM the irregularities (and all agree that there were many) were caused by sabotage from CUF members who had managed to infiltrate the CCM government-appointed ZEC, to remove a vehicle containing election materials and thus prevent the election taking place in a number of constituencies. CCM pointed out that several people had been arrested for removing a ZEC vehicle during election day. CCM Deputy Secretary General Seif Iddi was quoted in the press as saying it had been a CUF conspiracy and an act of sabotage. President Karume was said to have been very angry about this but CUF’s Seif Shariff Hamad had looked happy at the turn of events. For CCM and perhaps the majority of the population of Tanzania there is a desire for the Zanzibar election to be forgotten. Tanzania should be left alone to get on with its development. This may well happen. Tanzanians in general greatly enjoyed and were probably relieved by the American election debacle which took place at about the same time. So many of the phrases used to describe the Zanzibar election were soon being used in the debate on the Florida election such as -fraud, lost ballot boxes, miscounting of votes, stopping counting, uncertainty as to who had won ….. The idea of a ‘village museum’ seems a curious paradox ­is it a village, or is it a museum? Perhaps it is neither in the conventional sense. It is certainly not a living village, but rather a collection of authentic furnished homesteads representing some of Tanzania’s many different rural cultures. Nor is it a museum in the traditional sense (there is not a glass case to be seen). All 16 houses can be entered, and there are plenty of objects to see and handle. The Kiswahili word ‘makumbusho’, ‘reminders’, is more apt here than the English ‘museum, with its classical muse associations. Herein lies not only the unique charm of the place, but also the real importance of the site. The museum was founded in 1967 by two anthropologists, Tom Wylie and Peter Carter. The idea was not original, but in the Tanzanian context it had a particular significance at that time. By representing the diverse cultures of the newly-independent nation, it was like a microcosm of the country as a whole. From the start, the museum was built by Tanzanians, for Tanzanians. Representatives of the different ethnic groups built their own distinctive houses on the 8 ha site. The location in Dar es Salaam (next to the New Bagamoyo Road) was also significant, enabling people who had moved to the city to retain contact, and take pride in, their rural roots. Since its inception, The Village Museum -in common, it must be said, with most rural life museums in the UK -has had its ups and downs. By the early 1990s, it was apparently suffering from a serious shortage of funds and qualified staff and was threatened with closure. Since 1993, however, there has been a remarkable revival in fortunes. Staffing arrangements were restructured giving The Village Museum access to greater expertise. A grant through the Swedish African Museum Partnership (SAMP) enabled repairs to be carried out and new houses to be constructed. More recently, responsibility for the museum has passed from the Education Ministry to Tourism and Culture showing a new awareness of the site’s potential. So what of the museum today? Undoubtedly it is in very good hands. The Director General and staff of the National Museums of Tanzania have a strong sense of the museum’s responsibilities to the wider community and are keen to support its future development. The Curator, Jackson Kihiyo, who is a social anthropologist, has energy and imagination as well as a clear vision for the museum. It was a great pleasure to welcome him to Norfolk for a week’s visit in September. He has recently franchised the operation of the museum cafe to a first rate caterer who specialises in traditional dishes. Dance displays are now presented every week-end, while artists and craftspeople (such as Petre Paulo Mawige, a clay sculptor of striking originality) work on site on a commission basis. More significantly, perhaps, has been the development, since 1994, of the Ethnic Days programme, when, for two or three days (and attended by thousands), groups of people from particular ethnic groups present a cultural festival of music, dance, popular crafts and foods. They also bring with them records of their own lives, histories and traditions, which museum staff will compile into books for posterity. The Maasai book will be published soon. The museum’s Education Officer, Lucina Shayo, runs an imaginative programme for schools and has also raised funds and organised special events for some of Dar es Salaam’s ‘hidden’ children -the blind, disabled and mentally handicapped. So what of the future? Clearly, The Village Museum has a great deal going for it. But it also has its difficulties. Shortage of funds can cramp new initiatives. There is no photocopier or printer, no OHP or slide projector and only one computer with E-mail but not internet access. The overall visitor experience could be enhanced by improved interpretation on site -the existing panels are informative, but brief, and lacking the photographic references which could help ‘people’ the houses. A new guidebook is needed. The many different species of trees and shrubs on site could be labelled, and trails devised to focus on natural history or maths activities. A themed adventure playground would help to cater for family needs, and everyone would benefit from more seats around the site. Some of these projects have already been costed by museum staff, and business sponsorship is being sought to help with funding. The museum’s impressive thatched hall could provide an ideal venue for business conferences, training events and presentations, which would all help with funding (it recently made an atmospheric setting for a film festival). Next year, I plan to work at the museum in a voluntary capacity from July to December, helping with fundraising, educational resources and displays. I hope that during 2002, we will be able to host an exhibition about Tanzanian village life in Norfolk, including residencies by museum staff and craft makers. Meanwhile, some useful contacts have been established through the British Council and local Rotary clubs (who have funded a promotional leaflet). Website http://www.homestead.com/villagemuseum/index.html is also under construction. Please take a look at it -and, of course, be sure to visit the museum when you are next in Tanzania! Two Philippine firms have won the lease for the container terminal at the Port of Dar es Salaam. They will pay an annual fee of $3.4 million and a royalty of $1 for each six-meter container. The terminal can handle 100,000 containers a year and it is hoped to increase this to 200,000 over the next ten years -African Decisions. Alliance Air which began in 1995 ceased operations on October 10 following major differences between the partners and continuing losses. A group of businessmen were considering whether to continue it. -Dar es Salaam Financial Times. Barrick Gold Corporation has increased its estimate of gold reserves at its Bulyanhulu project in northwest Tanzania by 40% to 10.5 million ounces. Production will start in mid-200l. The TIMES (October 31) showed a picture of an opposition supporter in Zanzibar being thrown into a truck after clashing with police. The INDEPENDENT quoted the adverse comments of the Commonwealth observers. NEWSAFRICA (November 20) headlined its election coverage: ‘Nyerere’s legacy sold out; Party political squabbling and claims of fraud and vote rigging have exposed the political vacuum left by Julius Nyerere’. The BBC’s FOCUS ON AFRICA (October-December) lamented the lack of debate during the election on policies eg: AIDS, economic restructuring, public health, the East African Community, Burundi. All attention had been directed to personalities and they all seemed to have broadly the same policies. Under the heading ‘Costly victory’ Jackson Mwalalu in AFRICA TODAY (December) wrote that Tanzania’s ruling party got the candidate it wanted into the presidency of Zanzibar ‘but the Union may suffer as a result. President Karume, promising to open a new chapter in the history of the islands, must be aware … that the new chapter could well turn out to be as ugly as the olive branch he is extending to his opponents could be pointless ….. ‘ But NEW AFRICAN (December) under the heading ‘America can learn a thing or two’ brought in a new angle. ‘What’ it asked ‘do Tanzania and America have in common? Tanzania listens while America preaches what it doesn’t practice’. It quoted adverse American comments on the Zanzibar election and went on: ‘Interestingly, two days after the re-vote in Zanzibar, ‘irregularities’ were established to have taken place in Florida; … unopened ballot boxes found in a church … results delayed …. people divided, America, the great preacher of free and fair elections had not been able to have one. .. Salman Rushdie writing in The TIMES (December 9) said that it would be a long time before America could preach to the rest of the world about electoral transparency. The American election had been about as transparent as ‘a Floridian swamp’. The ECONOMIST (November 4) headed its article ‘Not so good in Zanzibar’ and wrote that CUF had almost no access to radio or newspapers during the election period and had reason to be angry. The EAST AFRICAN’S leader (November 6) under the heading ‘Thuggery by Mahita’s Men’ (Omar Mahita is Tanzania’s Inspector General of Police) wrote that ‘a cloud of shame is hanging over Tanzania because of the brutality visited upon citizens in Zanzibar …. In the same issue Tanzanian Michael Okema said that CUF knew that CCM would not readily concede defeat … but it needed an election through which it could expose the real intentions of CCM. CCM also needed an election behind which it could act and also to portray CUF as a party of troublemakers …. CUF obviously feels it cannot topple the government democratically or otherwise because the nature of the Union is such that the mainland will always prop it up. Weakening or even breaking up the Union then becomes a priority for anyone who wants to seize power in Zanzibar. 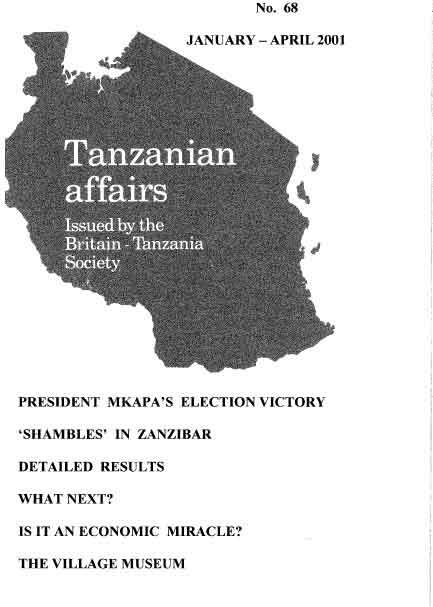 In the same issue, Tanzanian Issa Shivji’s article was headed ‘CCM Clearly Out to Steal the Election in Zanzibar’. He concluded: ‘People are said to get the rulers they deserve. I would like to believe that that does not apply to the children of the Mwalimu’. Under the heading ‘A question of democracy’ NEWSAFRICA (December 4) quoted CUF presidential candidate Ibrahim Lipumba as saying that the election process had been full of fictional goings-on that could only be found in Chinua Achebe’s novels. The article went on: ‘Given the level of acrimony, it was unsurprising that the opposition boycotted President Mkapa’s inauguration ceremony. How could one celebrate the crowning of a leader who stole votes’. President Mkapa however had dismissed the unco-operative opposition as people blinded with greed for power. The article added ‘President Karume, Zanzibar’s youngest President, is already cutting the figure of the humane and considerate President he is….. Many people, the opposition in particular, say the outcome of the last elections was depressing and disappointing. Many Tanzanians must be missing the late President Nyerere’. But FOCUS ON AFRICA’S January-March issue reported that ‘On polling day the ZEC official responsible for the Urban West Districts absconded, not reporting in until the following day. As a result many polling stations opened hours late’ thus confirming the CCM explanation ofwhat had happened. In South Africa among the headlines in BUSINESS DAY were: ‘Victory for Mkapa will be bitter sweet. … Election Chaos as Tanzanians Vote’. An article by David Martin in the SUNDAY INDEPENDENT had a touch of nostalgia. He wrote: ‘There was much to be cherished in the old system in Tanzania: The two contestants in each constituency (both from the CCM party) had to travel together in transport supplied by the party, sleep in the same room and eat from the same plate….from their joint platform the candidates could not promise, as is the way with politicians worldwide, that if voted into power they could do this or that for the electorate … under the western multiparty system anything goes, it has spawned a new breed of politicians who are younger and often unaware of the country’s history … money counts and buys votes … ethnicity and religion are rearing their ugly heads … ‘ (Thank you David Leishman for these and other items below from the South African press ­Editor). Under this heading The South African MAIL AND GUARDIAN (November 10) advised readers, if they visited Zanzibar (,where the beaches are postcard perfect~ white sand, green sea’) to leave again. It recommended them to go to a tiny strip of land about 13 km away which was even better: ‘Chumbe Island’s nature reserve beat 115 projects from 42 countries last year to win British Airways ‘Global Tourism for Tomorrow’ award. . . . Chumbe Coral Park was founded by Sibylle Riedmiller, a German environmentalist in her 70’s who visited the uninhabited island in 1991 … she turned it into an eco-resort for the free education of local children … only 14 overnight guests are allowed on the island at a time and they must have ‘zero impact’ … climb the 131 steps of the lighthouse built by the British in 1904 and you get the full 24 ha. extent of the place so thick with vegetation that no one has seen its rare deer population in years …. ‘ . The Australian CAMBRIDGE POST (October 21) featured as its main headline the arrival at the Isanga primary and secondary schools adjacent to the Resolute Gold Mine in Nzega of two container loads of books, sports gear and clothes donated by the paper’s readers. There was so much material that four other schools in the district benefited also. (Thankyou Mr Gledhill for sending this item -Editor). The 124~page winter edition of TRAVEL AFRICA contained an article on one of Tanzania’s least known and least visited national parks astride the Mikumi~Ifakara road -the Udzungwa Mountains. Extracts: ‘The park is renowned for its endemic species which include monkeys, the rare Abbott’s duiker, the endangered wild dog, the unusual and globally threatened forest partridge, the Rufous-winged sunbird, the dappled mountain robin and many butterflies and other smaller creatures found nowhere else. It is also the only place in East Africa with unbroken forest cover from lowland to montane. But most people who visit the area want to climb up to see the beautiful Sanje Falls’. Issue No 11 of DEVELOPMENTS, the International Development Magazine, contained a letter from environmentalist Dr John Henshaw complaining about criticism of the Tanzanian wildlife service for its alleged ill treatment of Maasai. He wrote that he saw no evidence of a vendetta against them by Tanzania National Parks, the Wildlife Department nor the Ngorongoro Conservation area many of whose staff were Maasai. Local people were involved in community participation programmes and the Maasai had received economic, compensatory and cultural benefits as a direct result of wildlife conservation and management programmes. The same journal also gave the story of a factory on the outskirts of Dar es Salaam -a mothballed clothing factory put out of business by second-hand western clothing imports -which had been converted into weaving mosquito nets. The factory now employed 140 people and was producing a range of nets sold on the streets where business was booming. In some regions less than 5% of the people were using nets -the only practical weapon against malaria where the drugs westerners rely on, at 20 US cents a daily dose, are prohibitively expensive. The political crisis in Zanzibar has turned the islands into a refugee-producing hot spot according to NEWSAFRICA (November 6) but British immigration authorities will not list Tanzania as a refugee-producing nation. The result is that the Zanzibaris are now applying for political asylum masquerading as Somalis, Sudanese, and Burundians. THE SWAHILI COAST (No 7, 2000) had an article headed ‘Zanzibar: Its history in stamps’ which explained how the first stamps were Indian and sold from a little office in the British Consulate in 1875. In 1890 Zanzibar became a British Protectorate and Thomas Remington was sent out from London to become the first postmaster. The Indian stamps were overprinted with the word Zanzibar. The first set of Zanzibar stamps showed Sultan Hamid bin Thwaini but before the stamps arrived from UK the Sultan had died. The article then traced the rule of other Sultan’s represented in stamps. After the 1964 revolution all mail had the Sultan’s face crossed or blacked out in ball pen and then new Zanzibar Republic stamps were produced. Other articles in this issue featured Bagamoyo and photographs of ‘millenium’ fashion. The UN’s AFRICA RECOVERY (July) wrote about the education of girls. Extracts: Tanzania has been more successful than many other developing countries in achieving gender equality, with girls making up 49.6% of the enrolled primary students in 1997. But only 56.7% of primary school age children attended school in 1998 … more than a million girls were still not in school. But girls in school suffer discriminatory practices like household workloads and their performance is consistently lower than that of boys especially in science and maths …. The November issue of SAWUBONA contained an illustrated article about a community of people whose origin is Zanzibar but who live in Chatworth, Durban. The article recalled how the slave trade had been abolished in 1807 and the Sultan of Zanzibar had declared the export of slaves forbidden in 1845. However, the abolition merely served to increase the price of slaves since only one in four of the dhows transporting the slaves managed to slip through the British and French warships patrolling the oceans. An Arab dhow transporting Zanzibaris to Arabia was intercepted in the Red Sea by a British warship and escorted back to Zanzibar. The British Consul had heard that there was a shortage of labour in Natal and over the next three years 600 Zanzibaris, an rescued from Arab dhows, were shipped to Durban as indentured labourers. The Zanzibaris established a community at King’s Rest in Durban. They cleared the land and built homes; they planted fruit orchards and large vegetable gardens. During apartheid in 1966 they were forcibly removed to Chatsworth. The government, not knowing how to classify them, put them in the ‘other Asians’ category. But the Indian community didn’t identify with them and the Zanzibaris found themselves isolated. 34 years later the community has grown from 600 to 5,000. Many have married into various African cultures while remaining faithful to Islam. The community is campaigning to be allowed to return to their old homes in Kings Rest. Sadly, many younger men are suffering from drug abuse and delinquency but the older generation still dream about being able to visit their motherland. It is not often that the WALL STREET JOURNAL features Tanzania on its front page. On September 25 it wrote: ‘For a Tanzanian long-distance runner the first order of business at the Australian Olympics was to bring the finish line into focus’. Restituta Joseph’s spectacles had been stolen at a track meet in Algeria but in Sydney she soon had a new pair. The day after, four other Tanzanian athletes went to see the dentist. “1 got my upper dentures refitted” said chef de mission Erasto Zambi showing off a smile. “They’ve got very good medical examinations here” he said. “Very good” …… The clinic helped over 1,000 people during the games. (Thank you Nick Weston for sending this item -Editor). Under this title REFUGEES wrote some time ago about how refugees who fled Zaire in 1996 were helped to return home by the 1,500ton lake steamer which shuttles between Kigoma and Uvira in the Congo. Originally named by the Germans ‘Gotsen’ she was converted into a gunboat during the First World War before being scuttled just outside Kigoma harbour, first taking care to oil all her machinery so as to be able to salvage her after the war. She was raised by the British and her story inspired the book ‘The African Queen’ and the 1950’s film. 28-year old medical student Godfrey Msemwa of the Muhimbili University College of Health Sciences, was killed by what was believed to be a shark in July. He had had gone swimming with friends at Coco Beach in Dar es Salaam and cried out for help frantically waving his hands in the air but was gradually pulled out to sea. Colleagues saw the water filled with blood a few minutes later. Following this horror, the marine specialist Hugo van Lawick , Director of Ocean Safaris, set off to sea in a special shark hunting boat. He took with him a bucket of frozen cow’s blood to attract the shark. This son of the renowned British chimpanzee researcher Jane Goodall said the blood can attract a shark even from two miles away. He continued to hunt the shark and eventually managed to catch one on his line. After some hours of tussle he managed to land it. It was a Zambezi shark noted for its killer instinct. Last year the Express had reported another shark attack which had involved an official of the Japan International Cooperation Agency who had had three fingers bitten off. Coco Beach has been placed out of bounds for swimming by Dar es Salaam Regional Commissioner Yusuf Makamba who also announced that a base station with satellite antennae and fast patrol boats to chase off sharks is to be established at Oyster Bay -The Express, the East African and the London Financial Times. Tanzania is facing an archetypal environmental issue. At stake is the future production capacity of a major new electric power station and the survival of a tiny toad scientifically known as Aspergnus nectophty. The new Kihansi Hydro power project is designed to generate electricity desperately needed for the national grid but it will only be able to operate at full capacity if it can use enough water. The tiny toad is found only in the Udzungwa ranges in Tanzania’s Southern Highlands. It is said to give birth to young ones rather than lay eggs and occupies an area of about 200 metres wide. However, if the power station were to operate at full capacity it would deny the toad sufficient water supply. It needs 20 cubic metres per second and if it doesn’t get it the environment could be destroyed leading to its extinction. TANESCO has therefore devised a temporary artificial water spray that delivers two cubic metres of water per second and has also agreed to participate in an international forum on the subject involving the National Environmental Management Council, foreign donor agencies like NORAD and the World Bank. -Daily News. Following the passage of the Copyright and Neighbouring Rights Act of 1999 a new ‘Business Registrations and Licensing Agency’ has been set up. Persons found guilty of infringement of others rights will be fined up to Shs 5 million or get imprisonment for up to five years -The East African which headed its article: ‘Tanzania Copyright Act is Music to Artists’ Ears’. A few days after President Mkapa called upon MP’s to help him to awaken sleeping ministers, the MP’s requested the Speaker to bring in new regulations to stop journalists from taking photographs of sleeping MP’s -The Guardian. An Indian Company, David Piereis International has introduced three-wheel hooded vehicles called Rajaj or more familiarly rickshaws in Dar es Salaam. Dr. A KEITH AUCKLAND, OBE who died on October 22 was described as a ‘hands on’ plant breeder in Tanzania where he spent almost 20 years from the early fifties. At Ukiriguru and Nachingwea he worked on sorghum, rice, sesame, and soya and in 1971 became Director of Plant Introduction and Distribution. He later served on many international research organisations around the world. IRENE BROWN was a lecturer in political philosophy in Dar es Salaam from 1964 and when she left was preparing a book on the ideas of political thinkers throughout history. (Thank you Joan Wicken for sending this obituary -Editor). BIBI TITI MOHAMED (75) who died in South Africa on November 6 was the first woman in the then Tanganyika to engage herself in full-time politics, relinquishing all else including family business to devote her life to the anti-colonial struggle in the 1950’s. She was divorced twice as she travelled the country mobilising the women, founding the women’s wing of TANU and being the first chairperson of the Umoja wa Wanawake wa Tanzania (UWT). She faced a major crisis in 1970 when she and six others were charged with treason; she was sentenced to life imprisonment but released two years later under a presidential amnesty. For the rest of her life she was dogged by ill health but was seen supporting CCM at the famous Temeke by-election last year and was with President Mkapa this year when he collected his presidential nomination forms in Dodoma -The Guardian. NARRATIONS OF SHEIKH THABIT KOMBO JECHA . (MASIMULIZI YA SHEIKH THABIT KOMBO JECHA) with a preface by Mwalimu Nyerere. Author: Minael H 0 Mdundu. Editor Paul Sozigwa. Dar es Salaam University Press. 270pp. In 13 chapters, several appendixes and bibliography based on recorded cassettes, the author captures Sheikh Thabit in his own words narrating his 82 years of life which covered both world wars. He died in 1986. His formal education finished at Form IV but he worked in a variety of jobs from seaman to weighing scale mechanic. The author traces Thabit’s history of the six political parties that arose in Zanzibar on what he calls racially based grounds and details the setting up of the Mro-Shirazi party and the later assassination of President Karume at which he was present ­Extract from a review in the Dar es Salaam Guardian by Edwin Semzaba. AGRARIAN ECONOMY, STATE AND SOCIETY IN CONTEMPORARY TANZANIA. Ed: P G Foster and Sam Maglrimbi. Ashgate. 1999. 282 pages. £42.50. Key areas covered in this book include credit, land refonn, agricultural extension, environmental issues, population, migration and social control. GENDER, FAMILY AND WORK IN TANZANIA. Eds: Colin Creighton and C K Omari. Ashgate. December 2000. 31Opp. £42.50. The social construction of marriage, the interplay of family life and gender relations with economic processes and forms of work. DAR ES SALAAM WATER DEMAND. AN END-USE PERSPECTIVE. Tanzania Centre for Energy, Environment. 1999. £9.95 from the Africa Book Centre. 138 pages. THE BIG C. A BBC Radio 4 programme on the 9th August. Producer: Geraldine Fitzgerald. In this programme Geoff Watts met the doctors and nurses of Tanzania’s only Cancer Institute. The Cancer Institute is in Dar es Salaam’s old Ocean Road Hospital. All five of the country’s oncologists are based there. Geoff Watt’s interview was conducted mainly with the doctor in charge who explained that there were about 20,000 new patients each year, many more women than men. It used to be thought that there was not much cancer in Africa but this is not so nowadays. There are even children with the disease. But not many cancer cases enter the health system in Tanzania. Sufferers often come too late because they are ignorant of the disease. Others do not come because they have to pay for all the drugs which are very expensive. Radiotherapy treatment is free but not chemotherapy. The National Health budget is about one dollar per person per year. The Institute relies on donations to keep going. A lot of sick people go to traditional healers for help. These healers are thriving because they understand the needs of the people, cultural and spiritual, better than professional doctors. Rather like our own holistic practitioners, I thought. Sometimes cancer is HIV related. HIV is really taking over medical resources. There are no funds for preventive measures for cancer so the emphasis on is on curing patients, but because of drug and equipment shortages, an innovative approach has to be adopted. The doctor in charge was trained in Glasgow and at first found trying to apply what he had learnt very difficult to apply in Dar es Salaam. Later he was able to return to Glasgow for a year, bearing in mind the conditions in Tanzania, and now he is able to approach his work in a more appropriate way. He said very definitely that he would rather work in Tanzania than for the NHS in the UK. There is no despondency at Ocean Road, he said. He added that lung cancer is not a problem yet but he is not happy with the commercialisation of tobacco firms. More people are smoking now in Tanzania. This was an informative and very interesting programme. When one considers all the medical facilities at our disposal in the UK, one can only admire the struggle in Tanzania to meet the needs of sick people. University Press. 2000. 247pp. £12.95. TANZANIANS ARISE AND GET RICH. H N Kida. Kai. Dar es Salaam. 1999. 205pp. ASIAN COMMUNITIES IN TANZANIA: A JOURNEY THROUGH PAST AND PRESENT TIMES. Institut fur Afrika­kunde, Hamburg. 1999. 211pp. Maps. ALMASI. Peter Wilson. Pentland Press. 109pp/ £7.50. In his retirement Peter Wilson has departed from Swahili grammar (‘Simplified Swahili’ and related books) and written an intriguing detective novel. When a Cessna plane crashes on Kilimanjaro in suspicious circumstances, diamond smuggling is suspected and a detective from UK is requested to assist the Tanzanian police. Some of the action takes place on the mountain and some at the diamond mine Buibui (spider) near the village of Sisimisi (very small ant) not far from Arusha. The whole tale moves along swiftly. I much enjoyed the humour throughout and the good descriptions of familiar places. Finally all the villains come to a sticky end and ‘la femme fatal’ who wins the heart of the British detective ­until he has second thoughts -retreats to her comfortable villa in Hounslow. Might there be a sequel? I wonder. CIVIL SERVICE REFORM IN TANZANIA: ORGANISATION AND EFFICIENCY THROUGH PROCESS CONSULTANCY. Ronald McGill. International Journal of Public Sector Management. 12 (5).1999. 9pp. Behind the tortuous jargon that perhaps an article in the learned IJPSM requires, lies a very interesting and heartening account of recent efforts in civil service reform in Tanzania. One real question is whether the management concepts and terminology really help us in any way. This article is apparently about ‘institutional development’ and ‘process consultancy’; it could equally be about ‘organisational development’ and ‘change management’ -all these are in practice fairly common sense approaches to capacity building in administrative reform. Tanzania like nearly all Sub-Saharan African countries had seen drastic declines in civil service efficiency and effectiveness. Demoralised officials could not and did not deliver and were increasingly being drawn into corruption; resources were far outrun by responsibilities, moving public administration onto an almost symbolic level; and service provision to citizens was increasingly non-existent. The reform programme recognised that external consultant driven reforms had proved completely ineffective. In an approach that has been paralleled, in for example, Zambia and Ghana, the alternative was to rely upon the knowledge and eventual commitment of middle level civil servants themselves. Once an overall framework for the reorganised ministries, departments and attendant functions had been established, officials were brought together in diagnostic and planning workshops where, after intensive rudimentary training, they were able to define problems and resulting solutions -and make plans for implementation. The commitment and motivation developed by this diagnostic/planning exercise also helped in implementation. Very impressive results are claimed in streamlining and efficiency improvement -though it is not clear whether these were actually achieved or merely declared targets. Experience in reform programmes of this type does show that this is an effective approach. Two of the essential requirements are recognised by McGill: some overall framework and guidance in terms of functions, ministerial portfolios etc; and skilful facilitation and guidance in workshops to ensure movement in the right direction. What is not made so clear is: the need for politicians to be involved in the process and share in the ownership and motivation; and the need for resources to be made available to implement reforms and new directions. The latter are not impossible though harder to provide in contemporary African conditions. Nonetheless, this is an encouraging account of an approach to CSR that is more productive than most. TRADING ON INEQUALITY: GENDER AND THE DRINKS TRADE IN SOUTHERN TANZANIA. Maia Green. Africa. 69 (3) 1999. Maia Green’s article offers a carefully researched and detailed study of one of the most important, and most neglected, areas of the informal economy. The sale of locally-made liquor is a vast business in Tanzania. The bulk of the alcohol consumed in Tanzania is made and sold in the informal sector -though always on a very small scale, so that this economy is vast in the aggregate, but also minute and ubiquitous. Yet we know very little about it, and the 1980s has somehow never come to embrace this most active and informal sector of the economy_ This article provides precise details of the costs and returns of brewing for small-scale women producers. Green shows how women’s involvement in brewing beer for this trade is a sign of political and economic exclusion -since they are denied access to other sources of income -but is also a potentially empowering economic strategy. In doing so, she makes a very significant contribution to overcoming the extraordinary lack of interest in or knowledge of this economy ­what Mike McCall has called the phenomenon of the ‘invisible brewer’. She argues that many women in the Mahenge highlands, her study area, rely on income from brewing, and that in doing so they are in effect buying their way out of involvement in grain farming, for they are unable to mobilize the labour needed for effective accumulation through agriculture. She distinguishes between investment brewers -a group of women who brew for sale only occasionally, to meet specific cash needs -and a smaller body of livelihood brewers. The latter are often female household heads, and rely almost entirely on brewing for a cash income. Interestingly, Green’s findings suggest a slightly different pattern of brewing here to that which I found in research in Rungwe/Kyela, and in other parts of East Africa. There it seemed that the most regular brewers were those who did have some other source of income, though generally a slight one. These women were, apparently, the most regular brewers because they could call on these other resources when their brewing activities ran into problems: when brews went wrong (as they do), when drinkers failed to pay (as they do), or when there was some unexpected demand for cash from some local official. Regrettably, Green does not deal with this last issue in this otherwise very valuable piece of research. There is a further story here -which Beidelman touched on, many years ago -of how the dynamics of sale and debt, and the rents extracted by local officials and ‘club’ owners, have an important effect upon the distribution of the cash income from the sale of local liquor, bringing benefits to men and to minor functionaries of the state, rather than to women. THE CULTURAL CONTEXT OF CHILDHOOD DIARRHOEA AMONG GOGO INFANTS. Mara Mabilia. Anthropology and Medicine 7 (2). 16pp. This article records the findings of Mabilia’s research into two types of childhood diarrhoea, attributed by the Gogo to states of breast-feeding and influenced by sexual behaviour. The Gogo interpretation and treatment was found by Mabilia, an Italian anthropologist, to differ markedly from the more clinical diagnosis and treatment which would be provided by a health centre. Herein lie considerable dangers for young Gogo children’s health and survival. Through her in-depth research Mabilia has identified cultural reasons why prescriptions of health clinics so often fail in the prevention of diarrhoea and malnutrition in Gogo infants, and by extrapolation in infant’s of other African countries (and Brazil). The importance of finding reasons is highlighted by the UNICEF report of 1998 which states that up to 2.2 million infant and child deaths (a year) are the result of dehydration due to persistent diarrhoea often accompanied by malnutrition. In Tanzania these diseases are the leading cause of morbidity and mortality in children under five. Using a variety of methods for her research in the Dodoma District Mabilia included a survey at the Cicongwe village dispensary in which a baby’s health was shown to be at risk after the first six months. Since Gogo explanation of diarrhoea seemed to be closely related to beliefs about sexual taboos and practices, the most rewarding results came from information obtained from friendships and intensive discussions with women and healers in the area. For this a deep knowledge of ‘cigogo’, the Gogo language, was essential to follow the use of double meaning, metaphor and mithonymics used by the women to explain the different situations involved in a child’s health. As Mabilia says “the utilisation of information concerning the mothers’ understanding of the nature and causes of diarrhoea can be very important for paediatricians in the treatment of diarrhoea”. It opens the way to new forms of communication with the users of medical services. A new (different) doctor ­patient relationship, more sensitive to the local meanings of disease effects, causes and practices, needs to be part of the multi-variable causes of diarrhoea and malnutrition. Thereafter successful health intervention is better assured. This article is recommended reading for all interested in the welfare of children and communities but especially for health specialists and biological anthropologists who work in Africa. PUBLIC SECTOR REFORM IN A POOR, AID­ DEPENDENT COUNTRY -TANZANIA. O. Therkildsen. Public Administration Development 20 61-71. 2000. This article describes how the multiple changes in the public sector during recent years have been pursued despite fragile political support and few service delivery improvements on the ground. The paper argues that this has been because of substantial external influences, fragmented domestic policy making, weak links between policy making and implementation and questionable assumptions about some of the reform measures -DRB. CULTURAL TRANSFER IN ADULT EDUCATION: THE CASE OF THE FOLK DEVELOPMENT COLLEGES IN TANZANIA. Alan Rogers. International Review of Education. 46 (1/2) 25 pages. This paper, about the Swedish financed Folk Colleges in Tanzania between 1975 and suggests that, for success to be achieved, there needs to be a match between the ideologies, discourse and functions of the educational institutions within both societies and that the transfer of more than one element of any educational system would assist take-up. FROM SOCIAL NEGOTIATION TO CONTRACT: SHIFTING STRATEGIES OF FARM LABOUR RECRUITMENT IN TANZANIA UNDER MARKET LIBERALISATION. S Ponte. World Development. 28 2000. 13 pages. WHY DO FARMERS EXPAND THEIR LAND INTO FORESTS? THEORIES AND EVIDENCE FROM TANZANIA (A Angelsen et al) and TANZANIA’S SOIL WEALTH (K A Brekke). Environment and Development Economics. 4 (3) July 1999. lSpp and 23pp respectively. EXPORTING, OWNERSHIP AND CONFIDENCE IN TANZANIAN ENTERPRISES. World Economy. 22 1999. 16pp. When Michael Wise, Reviews Editor of Tanzanian Affairs, passed away in November 1998 he left behind a big gap. We are now looking for a volunteer to take over the job he used to do. This involves collecting new books and articles about Tanzania, selecting those worthy of a full review, requesting help with such reviews or merely mentioning or briefly summarising the others. Just three times a year about 8 pages of Tanzanian Affairs are given over to these reviews and mentions. We will supply full details of all new publications and also a list of possible reviewers. Qualifications for the job? An interest in Tanzania and in books and word processing capacity. Please give me a phone call, or send a letter or an e­mail (the addresses are at the back) if you are interested in helping. Many thanks -Editor.